Looks like I am now a Lario owner. I saw this on the Book of Faces today. The previous owner's son borrowed it and it lost power so he pulled over. 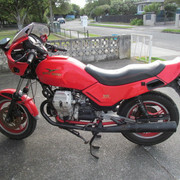 He and a friend then spent half an hour trying to bump start it with the result that one piston and valve is knackered. Not sure about the head. The price was good and I will go to bring it home later in the week. 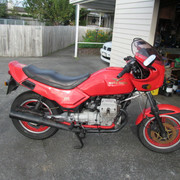 From the owner's memory its a 1989 model. Now whotcha gone and done Dave. Nice one, Dave. Another just right for UnZud's roads. Let us know if you need anything. 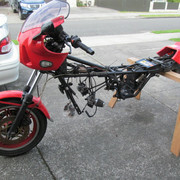 There's one in bits in the Shed here, and a frame coming to be fitted with all the Breva bits. 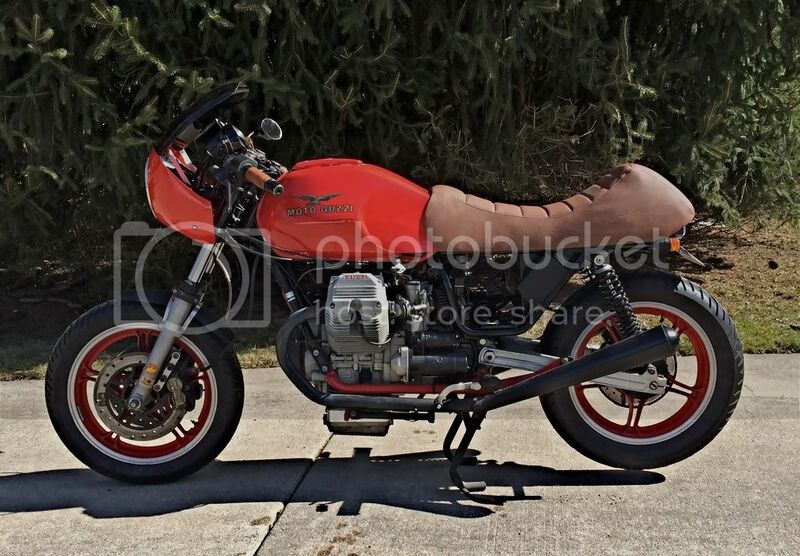 Martin (jacksonracing) has posted here with segments of his Lario fettling. An update. This arrived this morning. For it's age, according to the spec plate on the steering head its a 1988 model, its in surprisingly good condition cosmetically. The paint looks as though it needs a cut and polish to bring it right back. As yet I haven't been into the engine. I am going to leave it until my wife has seen it, after all she made me buy it because she thought I needed a project after finishing the V50 for my daughter. I have been reading Chuck's and Jim's posts again regarding refurbishing their Larios and talking to Brian about how to make the top end reliable. Looking forward to some fun! What are those things on the mufflers, heat shields? The look stock to me.. cant see too well with this tablet. What are those things on the mufflers, heat shields? They are heat shields of some kind. The only thing I can think of that they would protect is saddlebags. They are way too far back to do anything for the pillion's feet. 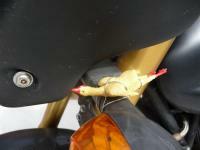 Injun Dave: Do you know the manufacturer of the fairing? It looks like it has been there forever. The indicator lenses are factory. I just went and had another closer look at the fairing. Some of the mounting hardware looks a bit home made so, maybe, its not an original fixture. nice Buy, there is some info available on how to make them last a bit longer. 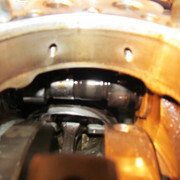 keep us posted with your results..
i think i will be changing a camshaft soon. 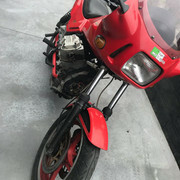 So, this afternoon, a wet and cold one, the first such day this year, well it IS autumn after all) I got out in the shed, put the Lario up on my work bench and started stripping the left side. The tank and side covers came off first and then the valve cover. Rockers off. 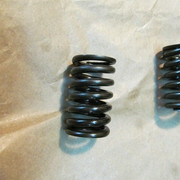 Single valve springs! Why did I think they had doubles? The head is a real mess. Not a good picture but there is damage to the cam, specifically the second lobe from the left. And while I was there I came across this interesting breather arrangement. 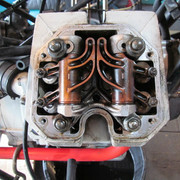 The top and bottom hoses come from the rocker cover. 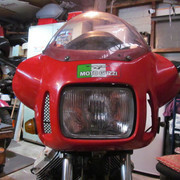 The middle one goes down to the sump and the two big ones on the rear side vent under the rear fairing. 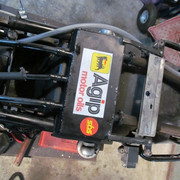 Tomorrow I will remove the oil pan and pull down the right side. I hope all is well in there. 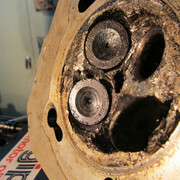 Yes, that's one of the big end bearings in the top left. 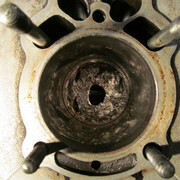 that is what a dropped exhaust valve looks like.... been there a couple of times. 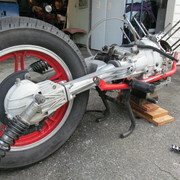 the head should be salvageable, , will need some welding , machining and new seats. 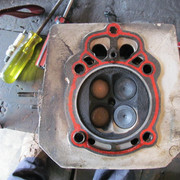 i wonder if a cylinder from a two valve engine could be modified to fit , i am running out of cylinders. i would be curious what valve was fitted, can you check with a magnet if the exhaust valves are stainless steel? the latest valves should be stainless ( so not magnetic) with just the top of the valves magnetic due to the stellite top. For the upper end of these engines you need upper end parts. Lots of weak areas and eventually your weakest link will give. Back to the shed this morning. We changed from Daylight Saving Time to NZ Standard Time last night so I have a theoretical extra hour to play with. First things first, I stripped the toasted head. The valve springs are single but not progressive. I tested the valves and found them all to be magnetic so indications are that they are the factory two-piece? Then I started on the right side. I can still see the cross-hatching in the cylinder. 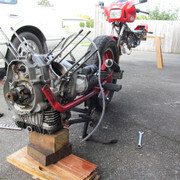 A short while later I had the frame separated from the rest of the bike. Lots more work saw the sump off. This is what we found in the bottom! 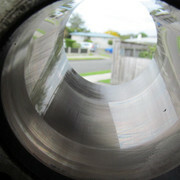 The damage to the cam lobe is more apparent in this photo. While I was doing the spanner work my amazing wife was busy with degreaser and a selection of brushes. Here is the result. Its almost 5.00pm. Time for food and, more importantly, a hot shower. More tomorrow. a broken camchain tensioner, first time i see one of those. 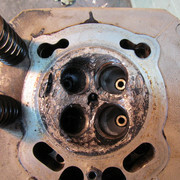 apparently somebody just removed the inner valve springs , in a efford to stop the valves from snapping. 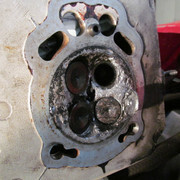 unfortunately he did not change the valves. Such a nice looking bike...wonder how a newer engine might fit. I know its a sacrilege. 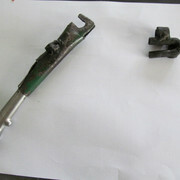 The clutch actuator arm was extended and the other piece raised the rear anchor point for the outer clutch cable. Not what you might call an elegant solution, but it really begs the question "Why?" 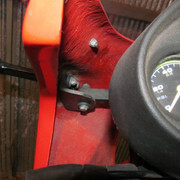 When I removed the sheet metal extension I found the original lever beneath, in perfect condition. 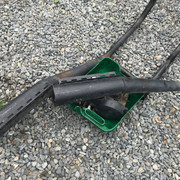 All I can think of is that there may, sometime in the past, have been s difficulty in obtaining a clutch cable and that this enabled something else to be used. I have been right inside. 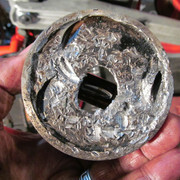 The sludge trap was clean and, although showing some small bright inclusions, the main bearings show little sign of wear. I think that the engine went bang and stopped before there was time for anything nasty to get pumped through. 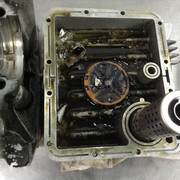 The oil pump looks pristine and had no detritus in it. 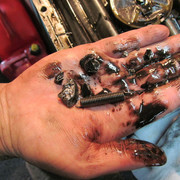 Even the oil filter had no bits in it although the wire screen was covered. There is no detectable up & down movement in the big ends. 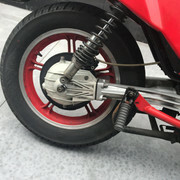 The big end bolts are so tight that my 10mm socket, although a good fit, wants to round off the nuts, so I have not yet been able to inspect the bearing shells. One cam follower has wear on the flat face but all the others appear fine. 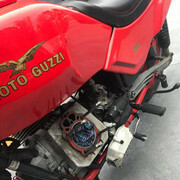 The clutch looks great. The gearbox seems to be selecting all the ratios it came with. The drive shaft and UJ are all fine. 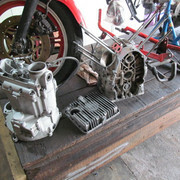 I have a lead on a left side cylinder, head and piston and should know by the end of the week if it is all available. I toyed with the idea of using twp-valve V65 bits. 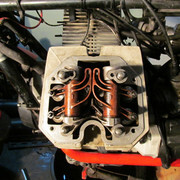 In some ways this may be a very good idea but I do like the idea of 4 valves per cylinder. 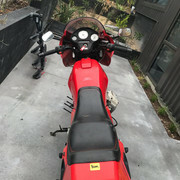 I have never ridden a Lario and would like to try it. We shall see. but there are many things beyond the myths that need sorting, took me a while before I was happy to button it up and treat it as designer intended. The clutch arm was probably extended to make the pull lighter dave..hope you can sort the bike out easily. 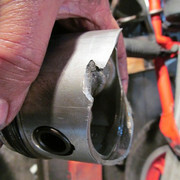 Is that what they call valve displacement? Holy pistons Batman! A bit of damage going on in there Dave. 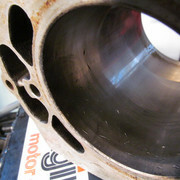 Not sure if they are the same heads but Niks Euro Bits has left hand heads for a v65. Nope. 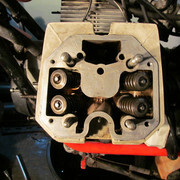 4V heads are beginning to be scarce on the ground.